Impress your guests with these sriracha king prawns with mango salsa – A wonderful sweet & spicy combination yet delicate and fresh to the palate. Incredibly easy to make, this colorful and healthy recipe takes only 10 mins to put together. You can also save time by preparing the salsa well in advance and grill the king prawns at the very last-minute It can be a real time-saver if you have a large group of friends over for dinner! I’m over obsessed with this mango salsa. Colorful, crunchy and refreshing, it combines sweet & savoury flavors in a delicate and harmonious way. I love adding some crunchy pomegranate seeds, but if they’re not in season you can easily skip them altogether. Mango is at its very best right now, choose one that still has a firm flesh, it will be easier to cube and the sweetness won’t overpower the other ingredients. I’ve brushed the king prawns with a little sriracha sauce and a pinch of chili flakes. The spicy kick brings this dish to a whole new level if you ask me. Spicy stuff is not your things? No worries, I’m not here to judge. Just take the sriracha out, and if you want substitute it with light soy sauce or toasted sesame oil, they’re both great additions. 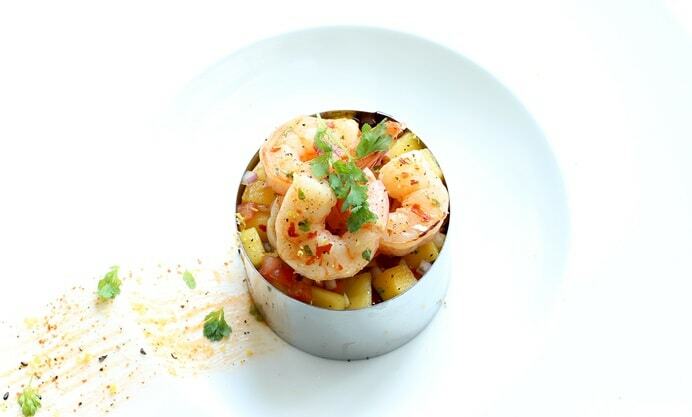 As fancy as it looks, all you need to turn these sriracha king prawns with mango salsa into a fine-dining dish is simple easy-to-find food rings. 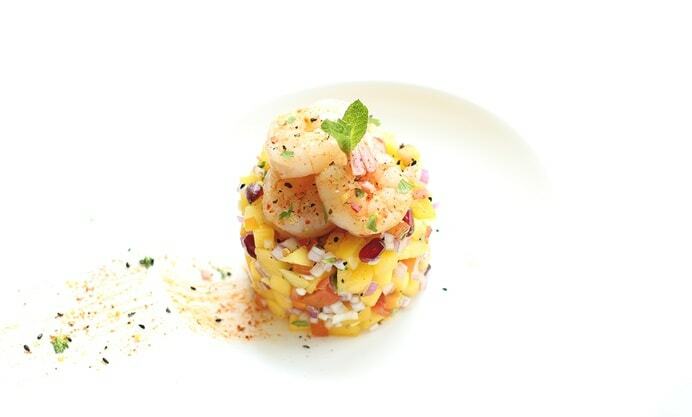 Just fold in spoonful or two of mango salsa into the rings and top with the grilled king prawns. If you don’t have food rings at hand, use a small bowl and turn it upside-down on the serving plate. You can also serve this dish into tiny shot glasses to create a super pretty summery finger food. 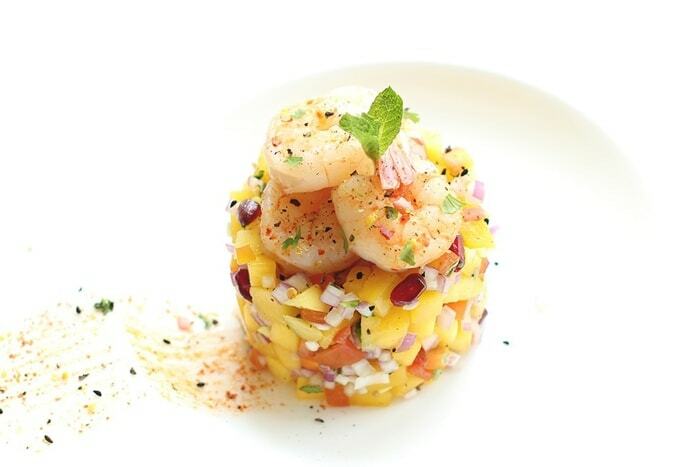 Impress your guests with these sriracha king prawns with mango salsa - A wonderful sweet & spicy combination yet delicate and fresh to the palate. Start with the prawns. Bring a saucepan of lightly salted water to the boil. Blanch the prawns for 30 seconds, drain and cool in iced water. Remove the heads, peel and devein, and place them on a chopping board. Brush with Sriracha sauce and season with black pepper and extra chilli flakes (optional). Heat a large griddle pan over a medium-high heat. Grill the prawns for 1 minute on each side, then remove from the pan and allow to cool slightly. 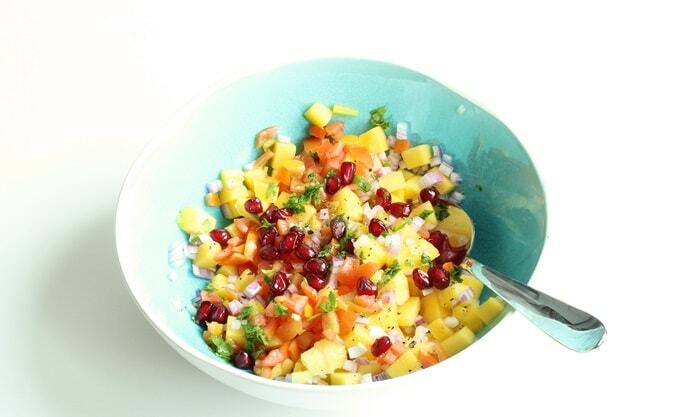 For mango salsa: Peel and finely dice the mango, place in a bowl and mix with the red onion, pomegranate, tomatoes, ginger, lime juice and coriander, and season to taste with salt and pepper. Place a metal pastry ring on a serving plate and fill it with mango salsa. 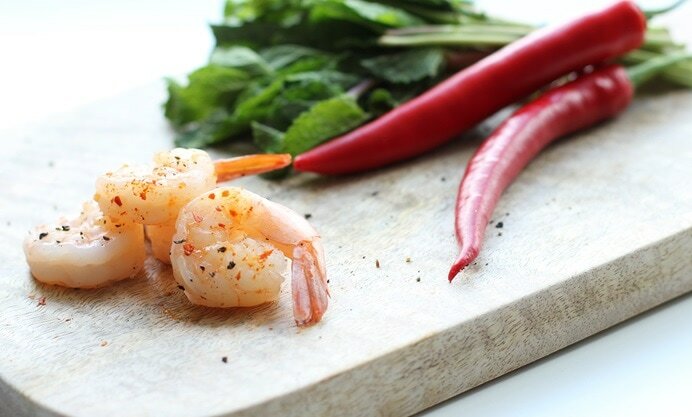 Top with grilled shriracha prawns, sprinkle with lemon zest and chopped coriander and serve immediately.